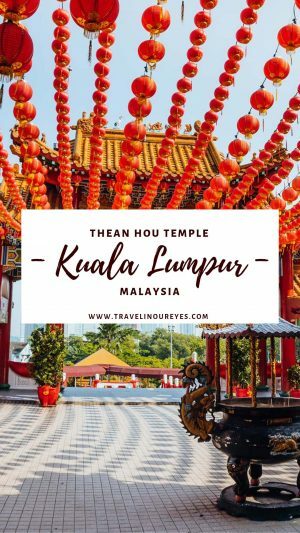 Being one of the largest temples in Malaysia and South East Asia, exploring Thean Hou Temple is a must when visiting Kuala Lumpur! Here’s everything you need to know before visiting Thean Hou Temple – from travel tips, the temple, dress code and how to get there! Get there early (before 8.00AM) and avoid visiting during prayer time or festive season to have the place almost all to yourself. There is no entrance fee for Thean Hou Temple. However, there is a donation box inside the temple. There is no strict dress code, but it is recommended to wear decent clothes as it is a place of worship. Be respectful and take off shoes when entering the main prayer hall. Wear comfortable shoes as there are quite a lot of stairs to climb. The temple is not wheelchair friendly as there is no ramp or elevator. Going here at night will make you feel like you’ve reached the stars! The Thean Hou Temple is a bit secluded from other places. The easiest way to get there is to take a GrabCar there. LRT train: The temple is 3km away from Bangsar LRT station. Take an LRT to the station and then you can get a GrabCar to the temple. You will approximately reach the place in 10 minutes. LRT train and walk: You can also get off at KL Sentral LRT Station and walk there (will take about 30 minutes) or GrabCar (10 mins). Monorail train: Get off at Tun Sambanthan, cross the Klang River and Jalan Syed Putra by the overhead pedestrian bridge to get to the Kuen Cheng High School on the other side. It is a 1.4km walk along the busy Jalan Syed Putra until you come to the Persiaran Endah intersection up the hill. For more information on navigating through the city, check our Kuala Lumpur Travel Guide For First-Timers here. There is no entrance fee to Thean Hou Temple. Yay! Opening hours: Officially, the opening hours are 09:00 – 18:00 Daily, including public holidays. Our Secret Tip: We got to Thean Hou Temple at 8am and it was open for us to go in and we had the place to ourselves except for a few of the keepers of the temple. At 8:30am, a few more people trickled in and by 9:00am or 9:15am, the tour buses were arriving. Unlike other religious places, this temple has no strict dress code. In the outside grounds, courtyard and upper floors, you can have bare shoulders and lengths above the knees. However, it is always recommended to dress decently as it is a place of worship. We would suggest bringing a wrap or shawl to cover bare shoulders or knees when you’re going into the main prayer hall out of respect. Also, remember to remove your shoes before stepping into the main prayer hall. 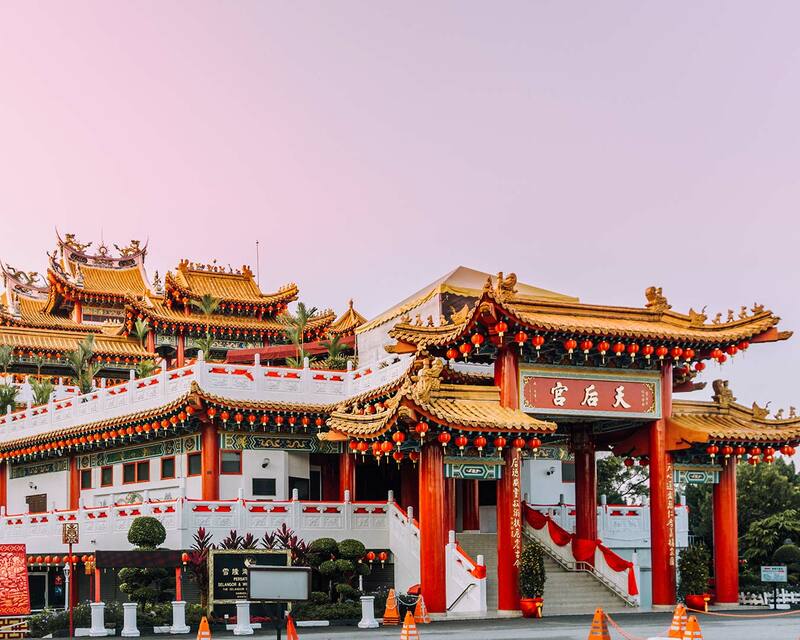 The Thean Hou Temple is a six-tiered temple to the sea goddess Mazu located in Kuala Lumpur, Malaysia. 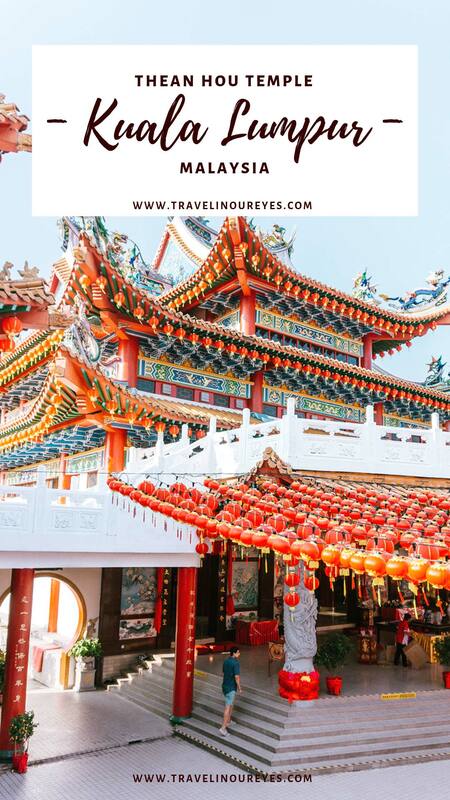 It is one of southeast Asia’s largest Chinese temples built on a small hilltop where you can overlook the entire city from the top of the temple. This vibrant temple features stunning architectures with majestic pillars, spectacular roofs, carvings and embellishments which make the overall appearance rather pleasing to the eye. Outside the temple, there are statues of the 12 animals of Chinese astrology. The temple also has a Chinese medicinal herbs garden and a tortoise pond. The place is picture worthy in all angles possible. It is almost impossible to get a bad shot of this temple. 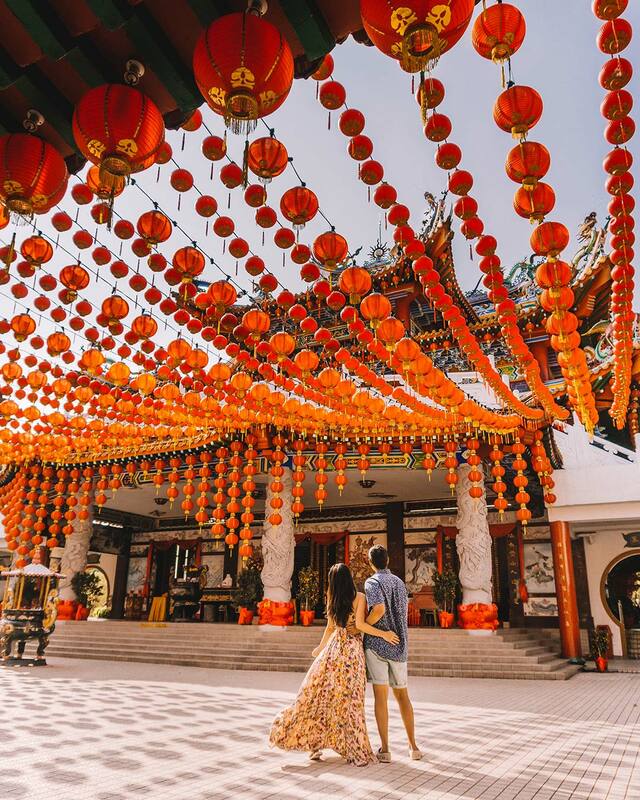 Once in a while, you can see couples use this temple as a wedding photo session place! You could easily spend a couple of hours here, enjoying the sights and the solace. If you want to try some delicious local snacks, visit downstairs for some sesame covered moshi. 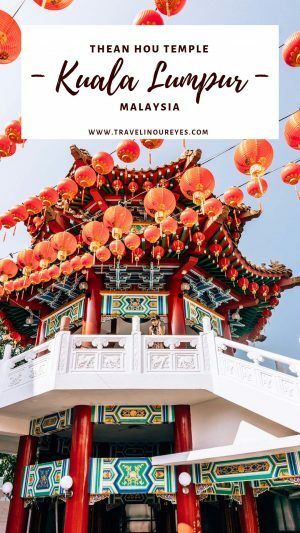 We hope the overview of the temple is the perfect guide to visit Thean Hou Temple. 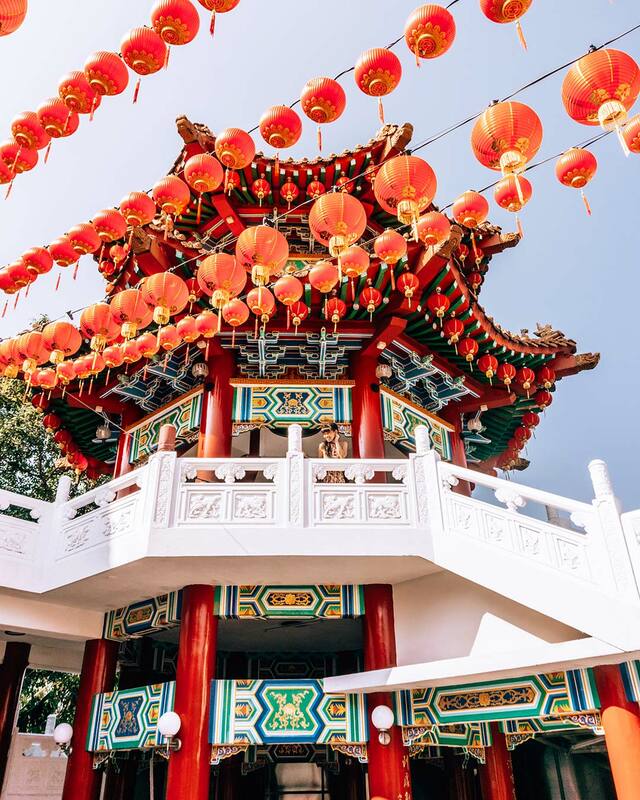 We hope you have an amazing time exploring Thean Hou Temple! It truly is like nothing you have seen before. Amazing pictures! 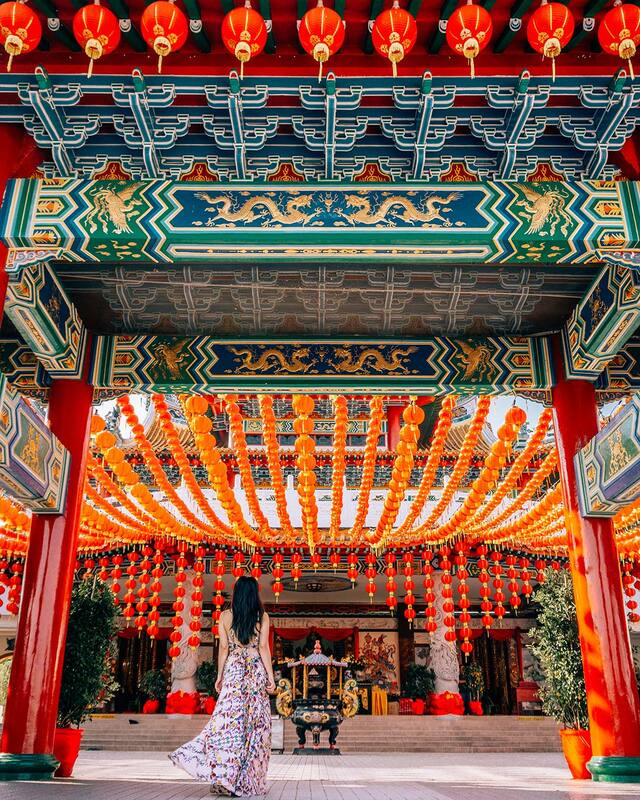 The vibrant colors in Thean Hou temple in Malaysia really is best compared to the cold climate during Winter. Thank you for the detailed information! Thank you so much! 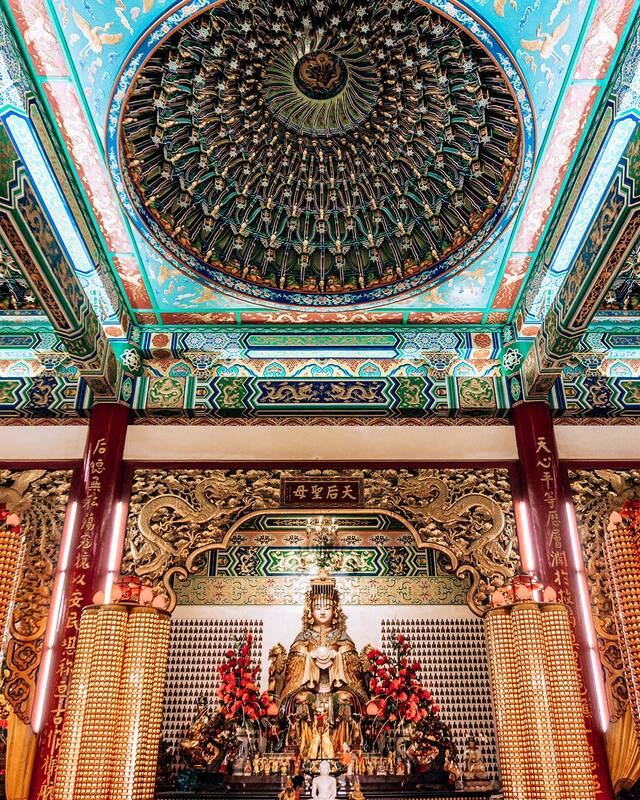 Thean Hou Temple really is super stunning. Have you visited? If not, think of getting away from winter for a bit and pop around Malaysia! Thanks for checking out the blog!